Zawiercie. The place to get your business going. Looking for an opportunity to combine business with pleasure? You will surely get one in Zawiercie - a town located in the very heart of the Polish Jurassic Highland [Polish: Jura Krakowsko-Częstochowska], and conveniently close to major routes. With investment opportunities in mind, the local authorities launched the Business Activity Zone (BAZ), covering a development land of more than 200 ha, which has been divided into 2 areas: A and B. The development plan sets out a detailed policy for the development and use of those parts. Part A, a land with the total area exceeding 150 ha located in the west precincts of the town, has been identified as suitable for “industry and services”. 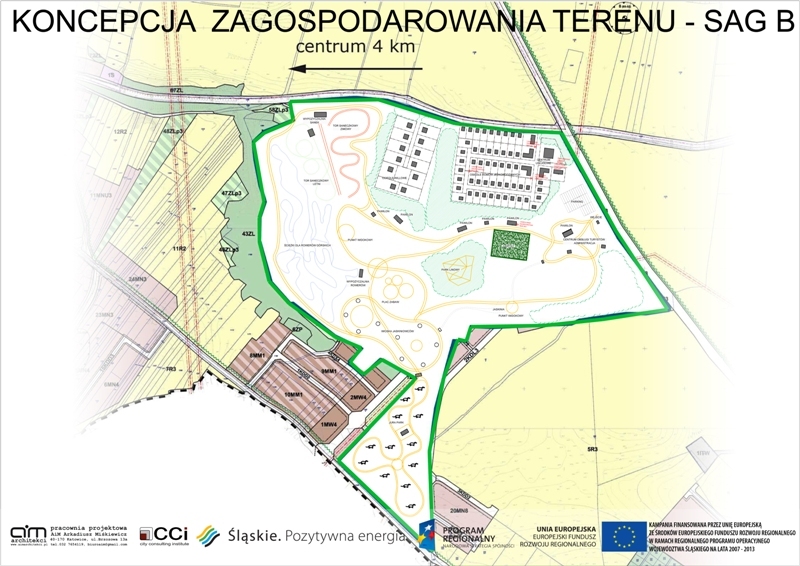 Some of the plots come within the area of the Special Economic Zone of Katowice, where the first undertaking has already got off the ground. Part B of the Zone lies in the east districts of the town, which were selected for planned housing development and recreation use. There are 3 various types of tax reliefs (local and income tax reliefs for SEZ) available for those who will start business here. The open attitude of local authorities ensures easy handling of procedures for acquisition of perpetual usufruct rights, which lowers the costs of starting a business. The possibility of rent or lease of modular production halls provide an alternative to the purchase of plots. Currently a road in BAZ is under construction. The locality has perfect leisure infrastructure offering sports activities to be pursued after work. Sited in the Jura, Zawiercie is within easy reach of many biking, hiking or horse-riding routes and trails, where you can enjoy climbing or resting in nature. BAZ A – the area is bounded by the streets: Wojska Polskiego, Myśliwska, Rolnicza, and Podmiejska. The area lies partly within the Special Economic Zone of Katowice. BAZ B – areas located within the Blanowice and Kromołów precincts, which lie in the buffer zone of the Eagle Nests Landscape Park. Development land for housing development, ecological building; tourism (accommodation), sports, recreation, entertainment, trade and catering services. Apartments, parking lots, garages and offices (utility buildings). Witaj, Aktualnie znajduję się w serwisie internetowym "zawiercie.eu", gdzie znalazłem interesujący artykuł, o którym chciałbym Cię poinformować. Artykuł ten dostępny jest pod adresem: http://www.zawiercie.eu/en Serdecznie polecam. The form recommending our webpage doesn't capute or save your personal data in our database.